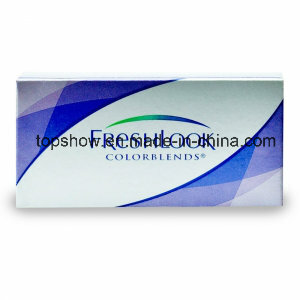 Find Colored Contact Lenses, Contact Lenses For Cosmetic, Freshlook Contact Lenses on Industry Directory, Reliable Manufacturer/Supplier/Factory from China. Color results may vary, depending on the user's eye color. Ready Stock and Available for Wholesale Please leave message for how many each color you want, if not we will ship out different colors in yout order. :) Messenger live inquary about color contact lenses Packaging Details: a piece is in a blister packing, 2 blister packing in one box packing. 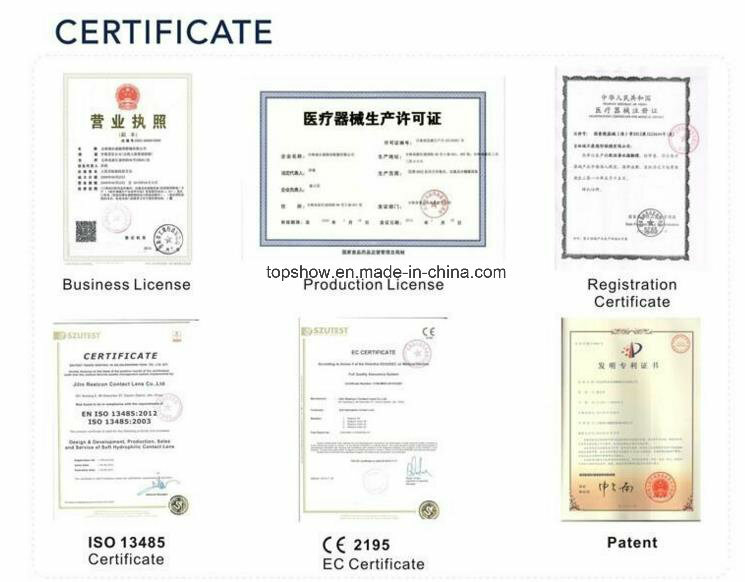 Q: What is our factory product range? A: 1) color contact lens and crazy contact lens . 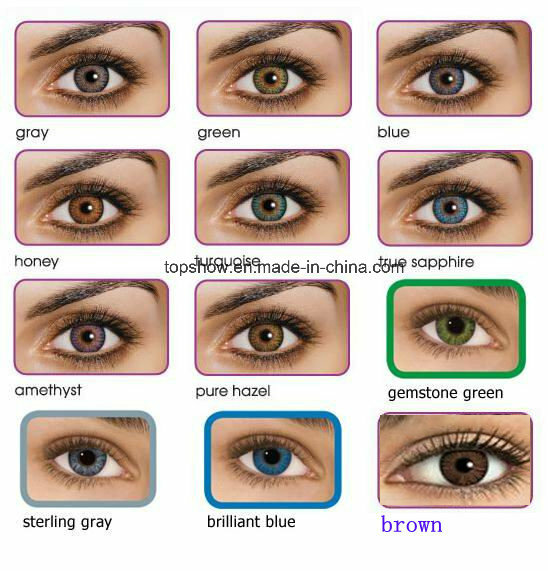 2)We have freshlook,GEO, singel color contact lens,2-tone , 3-tone and 4-tone contact lens. Q: MOQ of General order. A:Our MOQ is 50 pairs. Sample will be the best. 3)Shipping information:Company name,Address,Phone number,Destination seaport/airport. 4)Forwarder's contact details if there is any in China. A: 1)First,pls provide details of the products you need we quote for you. 2)If price is acceptable and client need sample,we provide Proforma Invoice for client to arrange payment for sample. 3)If client approve sample and require for bulk production for order,we will provide Proforma Invoice for client,and we will arrange to produce at once when we get 30% deposit. 4) We will send photos of all goods,packaging,details for client after goods are finished.We will arrange shipment and provide tracking number when the client pay the balance. A: Sure. Your logo or company name can be printed on your products . Q: What advantages we have? A: Rich experience: We have more than 10-year experience in this industry. That means,we can preview theproblems for the orders and products. Therefore,it will make sure to reduce the risk of bad situation to happen. Point to point service: There is one sale who will serve you from inquiry to products shipped out. During the process,you just need to discuss with her for all problems and the way saves much time. Strict QC: For each order,strict inspection will be carried out by the QC department before shipping. The bad quality will be avoid within door. A:1)we have blister packaging and vial packaging. 2)If you want to change the packaging,We need private consultations. A:Our MOQ of OEM is 1000 pairs. (OEM its full name is Original Equipment Manufacturer. it means that a manufacturer that owns the brand product but do not produces the product by itself. in other words, it pay more attention to develop and design new products by mastered the key technology and control sales channel while it entrusts other manufacturer to produce. after the product has been produced, An OEM will purchase the product and attach its own trade brand.) Enrich and diversify your life We focus entirely on the product. Contact us if you need more details on Colored Contact Lenses. We are ready to answer your questions on packaging, logistics, certification or any other aspects about Contact Lenses for Cosmetic、Freshlook Contact Lenses. If these products fail to match your need, please contact us and we would like to provide relevant information.